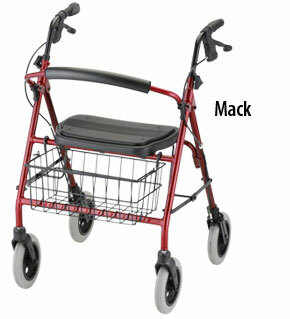 The Mack is a strong and reliable model of rolling walker, with a 400 pound weight capacity and standard height suitable for average to tall individuals. The Mini Mack is also available for petite users. The Mighty Mack is the strongest of all, with a weight capacity of 600 pounds. We have a huge selection of rolling walkers in our store showrooms. Come on in and take a test drive, and let our expert staff answer any questions you have.